If you have ever thought about being a Stampin’ Up! demonstrator, this is a great time to start. Read why I joined HERE. Pay $135 for your kit and you pick out $225 worth of current Stampin’ Up! products. This is the standard price of the demonstrator start kit. Pay $175 for your kit and you pick out $225 worth of current Stampin’ Up! products + get an exclusive Craft & Carry Tote (valued at $68)! 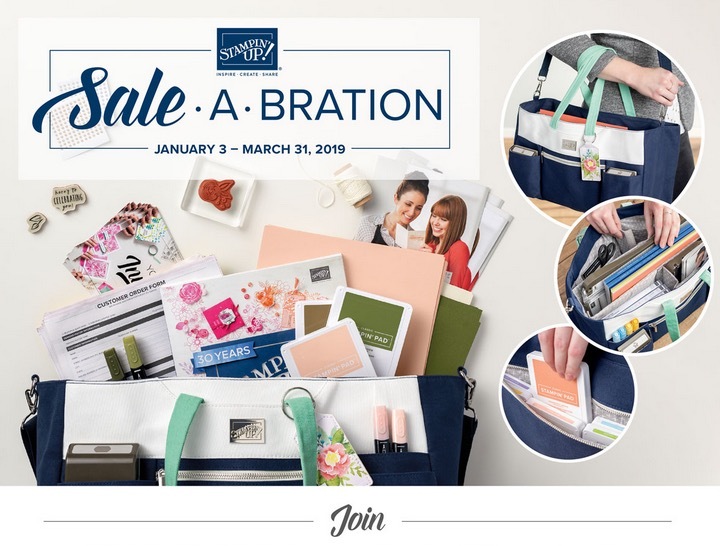 This is a special offer only available during Sale-a-bration. The Craft Tote is not available to buy separately. Both kits include $60 more product than usual and also include business supplies including 8 catalogues, order forms and more. The kits are customizable to allow you flexibility if you already own Stampin’ Up! products or if you want to focus on a particular area (like scrapbooking or colouring). Learn more about Stampin’ Up! demonstrators HERE. Get your new tote bag NOW and Join Now HERE.